Mud pie of a pitch, blah blah, downpour before the game blah blah, strong wind blah blah, banana skin blah blah, Mirallas man of the match, well, perhaps not so blah blah in the circumstances given his best mate was on the way to hospital at the time. Writing about a game of football after watching Oviedo’s hideous injury seems completely and utterly fatuous. So, I’ll just get those bits out-of-the-way and then write about Bryan himself. We were tested early on, we were clinical with our early opportunities, a very professional performance and a comfortable win. I’m delighted for Naismith who not only scored twice against tepid opposition, but ran his socks off and in to the spaces really well. He can also leap for a small man. McGeady worked a shift and some glimpses of what he can do were revealed. Stones continues to develop but he has shown a tendency to make schoolboy errors befitting his age, but he gets himself out of the trouble he creates for himself. And Mirallas, third game in a row for me, was MOTM, with tireless running, flicks, passes, movement and vision. Great. Sadly, Bryan Oviedo won’t be stopping at Anfield, and he is unlikely to be leaving his Hertfordshire hospital any time soon. I remember watching Eduardo and then Ramsey breaking their legs, and how sick it made me feel. Much the same last night really. No blame on the Stevenage player, no blame really on the glue-pot of a pitch, just one of those thankfully all too rare events on a sports field, and all we can do is applaud the medical support he got on the pitch from both sides, and the concern and consideration given to him by his fellow team mates. I’m no medical expert, but I suspect a clean Tib and Fib break is better than others in that it should knit back quickly, with the help of some ironmongery no doubt, and let’s hope he will come back better and stronger in what looks like a year’s absence from the game. Heartbreak for his World Cup dreams though, but he’ll only be 28 in 2018 and I for one hope Costa Rica qualify for that one, let alone do well in Brazil. Many were unsure about the prudence of buying the marauding left back from FC Copenhagen, especially as Baines was so strong , and in Bidwell (remember him?) and eventually Garbutt, we had two understudies with potential. But Bryan came with Champions League experience albeit brief, and a Costa Rica international to boot, and he knuckled down to play the role of squad member and occasional League Cup outings specialist, although inevitably these would be brief given our outstanding record of an early demise in that competition. But this season his chances came. An injury to Baines, an injury to Pienaar, and indeed to others, and he has found himself performing and performing really well at Left Back, Left Midfield and even (oddly) on the right of midfield too. Not from him have we heard the whines of Vellios, not from him have we had the truculence of Drenthe, not from him have we seen the lethargy and CBA attitude of Fellaini, we have instead seen a polished professional who trains hard, plays hard, and also plays with a good degree of skill. And there was that goal. A win at United. What was he even doing there anyway? Bryan writes himself in to Everton folklore, sitting atop the mountainous Distin in celebration, a smile as broad as you like, and safe in the knowledge that his time had come, a just reward for his immeasurable patience. And then Costa Rica only get drawn in England’s group, don’t they? Wow, what a season 13/14 was turning out to be. And then, indeed, wow. 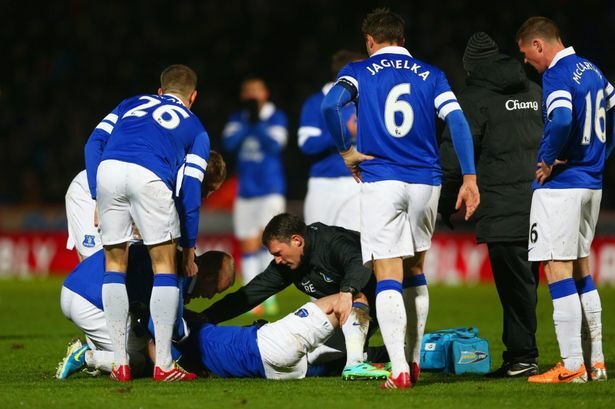 A season-ending, World Cup-ending broken leg for one of the most popular players in the Everton squad. I feel so sorry for him, but will also trust in the considerable skill of surgeons, medics, physios and fitness trainers, and will instead send him some calcium supplements from Boots to boost his bone rebuilding! Bryan will be back. He will come back stronger. And in the mean time, I just have a sneaking feeling his injury will have a positive impact on galvanising his team, not just for Anfield, but for the rest of this season. Let’s hope so, and wish ‘consign bien pronto’ to the best little Costa Rican we know. Next Post Is Canales already an Evertonian?